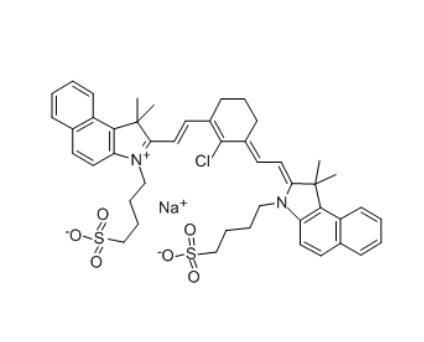 New indocyanine green CAS number 172616-80-7, it is a class of near infrared dyes, has a very special status in the field of medical fluorescence imaging. Fluorescence imaging is an imaging technique based on the injection of fluorescently labeled drugs or other substances into animals or humans and the detection of fluorescent marker localization, which plays an important role in modern medicine, primarily as other methods such as: ultrasonic back- Radiography, X-tomography and other methods of complementary imaging technology. In the current technology,, indocyanine green CAS 172616-80-7, which is a fluorescent label, rapidly aggregates in a polar solvent, has poor stability, is rapidly cleared in plasma, has a short cycle time in the body, and indole cyanine green is lack of tumor cell targeting specificity, these defects greatly limit the application of indocyanine green CAS 172616-80-7. New indocyanine green as a class of near infrared dyes, with its excellent fluorescence penetration, good color rendering and better stability is gradually replacing the indocyanine green in the field of medical fluorescence imaging. In addition, the new indocyanine green can also be used as a photothermal preparation in clinical hyperthermia and has a better therapeutic effect. Looking for ideal 172616-80-7 Manufacturer & supplier ? We have a wide selection at great prices to help you get creative. All the CAS 172616-80-7 are quality guaranteed. We are China Origin Factory of CAS Number 172616-80-7. If you have any question, please feel free to contact us.